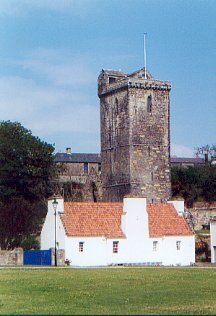 An ancient burgh town on the south coast of Fife, Dysart lies to the northeast of Kirkcaldy with which it was incorporated in 1930. Said to be named after the cave or desert used as a retreat by St. Serf, the town received its royal charter in 1587. Once an important coal mining and salt panning centre, it had by the 18th century developed a reputation for the manufacture of linen and nails and as a port trading with the Netherlands. Modern industries include meat processing and the manufacture of soft drinks. After years of decline, some of its shorefront buildings (Pan Ha') were restored in 1969 by the National Trust for Scotland under its Little Houses Improvement Scheme. Other interesting buildings include St. Serf's Tower (16th century), the Tolbooth (1567), Dysart House (1756), and the birthplace (now a museum) of John McDouall Stuart (1815-66) who was the first explorer to complete the return journey traversing Australia from south to north in 1861-62. The Man in the Rock was carved into a cliff in 1851 by a local sculptor, inspired by Byron's "Prisoner of Chillon", but destroyed by a storm in October 1970. Dysart has served as a filming location for White Out (2011) and the successful time-travel fantasy series Outlander (2016).